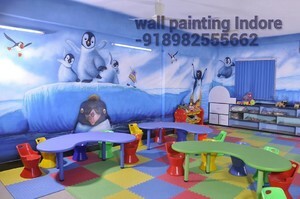 We undertake all types of cartoon painting for kids room, creates a new atmosphere for kids every day as it gives them a fresh feeling in their room walls, we do the painting of Mickey, Pluto, Pooh and Gang etc, let's just say, growing up has never been so much fun and joy. We also undertake night sky glow ceiling painting for the children bedroom. I would like it if I would get a chance to share my artistic talent with you. It would be a pleasure for me to clear your queries.